The Cape Winelands are one of the great wine capitals of the world—they manage to compete with the likes of Bordeaux, Adelaide, and Verona. If you’re thinking of taking a trip to one of the wine capitals, we highly recommend the Cape Winelands. The winelands offer a unique and incredible experience—one that is definitely worth crossing off your bucket list. The overwhelming beauty of the Cape Winelands is something that one won’t easily forget. Although places like Adelaide and Bordeaux each have their own allure, they cannot compete with the absolutely picturesque landscape that the Cape Winelands boast. The winelands manage to combine quaint history, perfect natural beauty, and thrilling adventure together to create an utterly unforgettable escapade to Africa. The first, and possibly most famous, wine district that is an absolute ‘must’ if you’re planning a trip to the Cape Winelands is, of course, spectacular Stellenbosch. It is a convenient thirty minute drive from Cape Town and it dates back to 1679. If it’s history that you’re after, Stellenbosch is the ideal district for you. It is the second oldest preserved town in South Africa with buildings that are characterised by their Victorian, neo-Dutch, and Georgian architectural style. From its superb five-star restaurants to its lively arts and culture scene, Stellenbosch has so much on offer. There’s a reason Stellenbosch has earned its reputation as the Wine and Food Capital of South Africa. If adventure is what you’re after, then another beautiful district to visit is Ceres. Ceres is known for its amazingly fresh fruit and fruit juices but, what you may not know is that it is the perfect destination for enthusiastic thrill-seekers. Visitors can treat themselves to game and nature reserves and there are plenty of hiking trails for passionate hikers. If these activities aren’t adventurous enough for you, you could always treat yourself to Ceres’ excellent 4×4 routes, or you could try out the breath-taking zip line if you’re feeling brave enough. The gorgeous Worcester wine and olive route is another district that should not be missed if you’re touring the Cape Winelands. It is the most centrally located district and it boasts twelve magnificent wine cellars as well as the Willow Creek Olive Estate. The Worcester wine and olive route truly has something for everyone. This district is particularly scenic because it is surrounded by the spectacular Brandwacht and Langeberge mountains. Guests can treat themselves to the best olive products that South Africa has to offer whilst indulging in glasses of award-winning wines. The route also caters to adventurous guests who can delight in the abundance of outdoor activities which include mountain biking, fishing, golfing, and hiking. Perhaps the most beautiful, and certainly our favourite, district is Franschhoek. Franschhoek manages to combine history, culture, food, and fine wine into one magnificently memorable experience. Surrounded by spectacular mountain slopes, with stunning vineyards as far as the eye can see, Franschhoek is certainly not to be missed. Make this idyllic valley your home for a few days whilst you indulge in all Franschhoek has to offer. Why not stay at Leeu House—a 5-star traditional Cape Dutch country guesthouse with world-class cuisine? 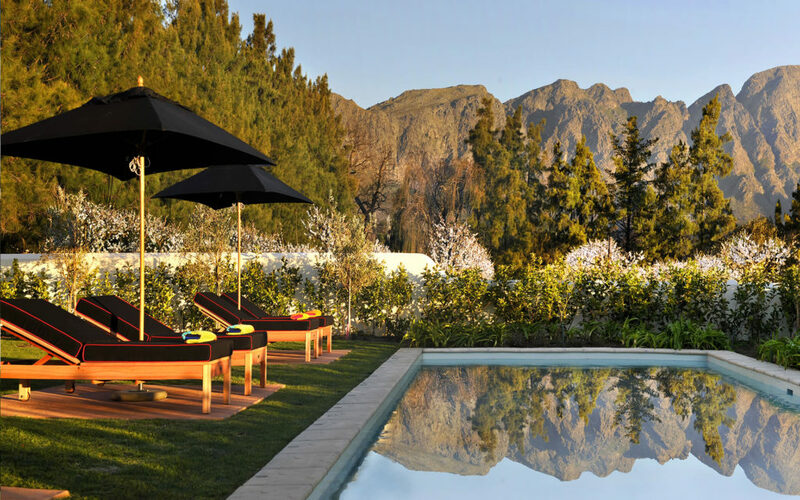 La Residence, voted No 1 Hotel in the World in 2013 by Conde Nast, is the absolute pinnacle of luxury and is also nestled amongst vineyards on the slopes of the Franschhoek Mountains. If you enjoy the country life and need some time out to relax, consider staying at La Petite Ferme—the perfect place to escape the bright city lights. La Petite Ferme promises to spoil guests with first-class wine and delicious food. Wherever you choose to stay, we guarantee Franschhoek will not disappoint. There are plenty of other districts to visit in the Cape Winelands for you to discover and adding the winelands to your bucket list is definitely worth it! If Franschhoek has caught your eye then give us a call and we’ll ensure the experience of a lifetime for you in this fantastic valley.